The Compressor Used In the World's Finest Recording Facilities! 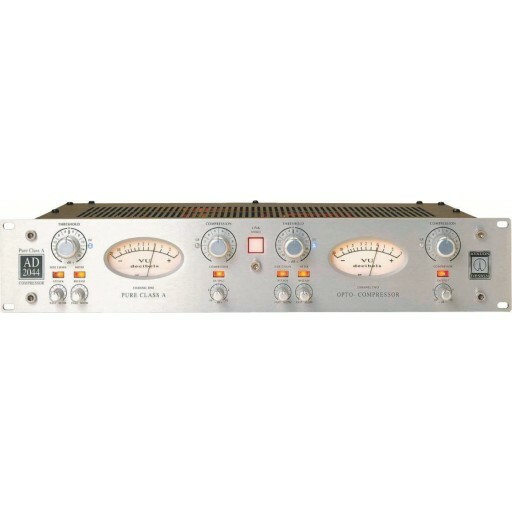 If you need compression but don't want that "compressed" sound, the Avalon AD2044 Dual Mono Compressor is an ideal choice! The AD2044 is dead quiet, absolutely transparent, and delivers full frequency response even during heavy squeezing. That's why you'll find the AD2044 in major recording studios worldwide! You'll find the AD2044 in the world's leading recording studios, mastering facilities and artist/producers' outboard racks. These professionals rely on the AD2044 daily to help them complete their "sonic signature" and turn recordings into musical masterpieces. Just hearing the comments of audio pros tells the story: "...does simply amazing things for vocals and bass guitar as well as across the stereo bus" - "...It can also warm things up if pushed a bit harder" - "...If you can only own one analog compressor, I don't think anyone can possibly go wrong choosing this one!" The AD2044 offers optical compression that you'll have to hear to believe! Custom manufactured high-speed linear opto elements provide the non-invasive passive attenuator system for invisible gain reduction. The AD2044 incorporates a unique external control loop and current-monitored optical driver for smooth control plus the benefits of traditional vintage LDR compression. These "invisible" opto elements enable the AD2044 to deliver totally transparent, low noise gain reduction. The AD2044 features a 100% discrete, pure class A signal amplifier to compliment the with high-speed current monitored optical control elements. Designed to optimize absolute signal integrity and musical performance, the AD2044 combines advanced electronics with sonic excellence unequaled by lesser designs. The AD2044 is the perfect solution for two-bus music/program compression, mono bass and instruments and mastering applications. Avalon's advanced true symmetry design offers high-voltage, large headroom, extended bandwidth and very low noise. The use of 100% discrete, Pure Class A signal amplifiers offer the serious music professional unlimited sonic character and a natural harmonic detail that enhances the program material and becomes one with the music itself. What all this means for you and your music is this: the AD2044 guarantees a beautiful sound and "character" that are second to none!